All winter bus services have now finished for the 2018/19 season. 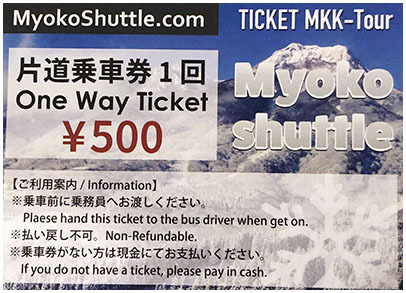 Please purchase and use the Myoko Shuttle 500 yen bus tickets. Please give the ticket to the driver when boarding. It is 500 yen one way to any stop on the line. You will need 2 tickets (1,000yen) for a round trip. ※This ticket is valid only for Akakura – Ikenotaira – Suginohara line. ※For unused tickets you can get a refund ONLY at the place you purchased them. ※ You can not get a refund from your hotel. Please pay cash before you board the bus. This shuttle requires booking in advance, but you can still pay in cash when you board. As this is a reservation based service the departure time is dependent on the guests using the shuttle. To book e-mail the shuttle company from their homepage. The cost of the shuttle is 30,000 Yen but this is split between the number of people on the bus. So the more that ride the cheaper the service becomes.